Solar panels on the roof of Homerton Grove Adventure Playground’s building have recently been repaired in a joint project by playground staff and volunteers from local community group Hackney Energy. Volunteers from Hackney Energy and the first solar co-operative to be launched in the borough, Banister House Solar Co-op, helped repair the system – one of the first of its kind to be connected to the national grid. The team, working with Hackney-based solar firm Athena Electrical, found it was the wiring and the inverter that had stopped working. The inverter is crucial as it transforms the energy generated by the panels from DC electricity to AC so it can work in the national grid. The panels were installed nearly 20 years ago by Wind and Sun and are still in good working order. The company gave the new inverter to the playground at a reduced cost in order for them to get back on the grid. Bridget Handscombe, Play Manager for Hackney Play Association, which runs the playground on Wardle Street, said: “I’d had quotes of £6,000 to replace the inverter but we couldn’t even start to look at paying something like that. Green Party MEP for London Jean Lambert attended the launch of the new solar system. 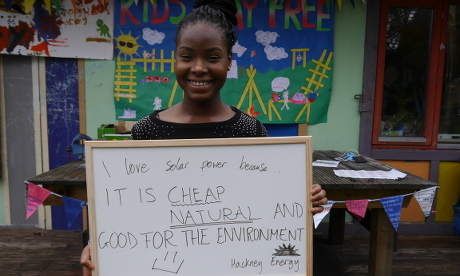 She said: “”It’s fantastic to see solar power back in action at Homerton Grove Adventure Playground, and community projects in Hackney leading the way. Some of the volunteers who took part in the project were young people from the Banister House Estate in Homerton currently taking part in an internship scheme organised by the Banister House Solar Co-op. Victoria Omobuwajo, one of the Banister House interns, said: “I always knew that fossil fuels were harming the environment and think solar is a great idea. “Working with Hackney Energy as one of the Banister interns has showed me it is possible to make solar work in the UK. A lot of people on the Banister Estate don’t really know about solar and how it’s going to benefit them – we are showing them that it can save you money and is great for the environment. “One of my main aims is to take solar to other countries that don’t have electricity. My mum lives in Nigeria and when the only electricity provider turns the power off, she has to use a generator just so she can call me. This entry was posted in Uncategorized and tagged Athena Electrical, Banister House, Co-operative, Hackney Energy, Homerton, Jean Lambert, Solar on September 25, 2014 by kirstystyles1.